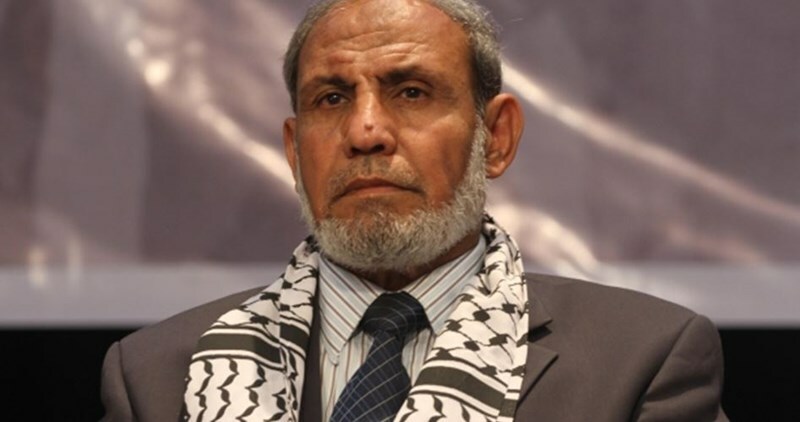 Member of Hamas's political bureau Mahmoud al-Zahhar has described Avigdor Lieberman, Israel's war minister, as an "inexperienced person who needs an ear pinch to make him learn the lesson." Zahhar made the remarks to Fars News agency commenting on Lieberman's renewed call for demilitarizing Gaza as a condition for rebuilding and helping it. The interview was published on Wednesday, August 25. "He need an ear pinch in order to learn not to make conditions that cannot be realized on the ground," Zahhar said. He affirmed that Lieberman's recent attempts to lessen the fears of settlers who fled their homes in settlements around Gaza were useless. "Lieberman came to say, 'I am not like my predecessors, I am scarier, I have a new military policy.' All this talk in fact is groundless," the Hamas official underlined. The official also talked about several issues, including his Movement's relations with Iran which he described it as "better than before". He also criticized some Arab regimes for seeking to establish relations with Israel. Gilad Paz, an Israeli citizen and human rights activist who openly supports the Boycotts Divestments and Sanctions (BDS) movement against Israel, has applied for asylum in Canada, claiming he was the victim of political persecuted because of his position. "I am politically persecuted in Israel. I realized that people like me have no place in the country, so I decided to leave before it's too late," Paz said in an interview with Ynet. Upon landing at the airport in Montreal on August 11 Paz, a lawyer dealing with human rights and labor law, immediately submitted a formal request for political asylum. In addition, he was active in the human rights organization Amnesty Israel as well as left-wing political party Meretz. An independent lawyer, Paz has represented Arab-Israeli clients and Palestinians from the territories. "I haven't believed in the State of Israel for a long time," said Paz. "I believe that the Zionist idea was a fundamental mistake and we are paying a heavy price for it today. The original sin was the Nakba, and later the despicable occupation of 1967 and the deterioration of the situation. I support BDS because I don't think Israel understands any other language." According to Paz, he decided to leave Israel and apply for asylum in Canada due to pressure from Public Security Minister Gilad Erdan and Interior Minister Aryeh Deri against BDS activists. "I submitted the application as a result of the declaration by Erdan and Deri to deport and refuse entry to BDS activists with foreign citizenship. I decided to turn to Canada because they are the most open to requests for political asylum," explained Paz. "Erdan and Deri don't like people like me as much as they don't like foreigners, but when it comes to a person like me, who is a citizen of Israel by birth, they have a legal problem which makes it difficult for them to deport me by force,” he continued. "It's been said that people like me will pay the price, and from what I understand by public statements made by the minister, there is now a legal team at the Ministry of Strategic Affairs which is looking for all sorts of ways to hurt people like me legally — whether by criminal or civil methods. I'm very curious, but on the other hand, I am not a masochist. As such, I decided not to wait for Israel to make that decision, but rather took preemptive measures," Paz added. In his asylum application, Paz claims that he suffered political persecution in Israel because he is a BDS activist and he is afraid to go back to Israel with the current political makeup of the country. "My family doesn't really accept my decision. They don't hold the same opinions and don't support my agenda," Paz admitted. Following his request for asylum, Canadian authorities have allowed him to enter the country and set a hearing before a judge at the end of next month. Until then, he is authorized to travel within Canada, but not to leave, as his passport is with local authorities. Addressing the accusation that he is a traitor to his country, Paz replied, "Israel is a democratic country. I am not obliged to adopt the agenda of the State of Israel like some sort of parrot. I understand that there is brainwashing here that the entire world is against us. We all saw the NGO law that targeted friendly countries who support human rights such as the Netherlands, Norway, and Sweden. Everyone is an anti-Semite, everyone hates us. I am an Israeli that believes there is another way. I left this country and I will only come back when there is a drastic change in policy." "In many countries around the world boycotting Israel has been outlawed with trangressors facing a steep price to pay, such as commerce penalties. As such, it is obvious that within Israel, there needs to be a cost to the people who slander Israel around the world and support a boycott," the minister added. The president toured one of the Hamas tunnels recently uncovered on the border by the IDF, and was briefed on the military’s day-to-day activities in the area and on work to combat the tunnel threat. Rivlin was accompanied by IDF Chief of Staff Lt. Gen. Gadi Eisenkot, GOC Southern Command Maj. Gen. Eyal Zamir, and Gaza Division commander Brig. Gen. Yehuda Fox. 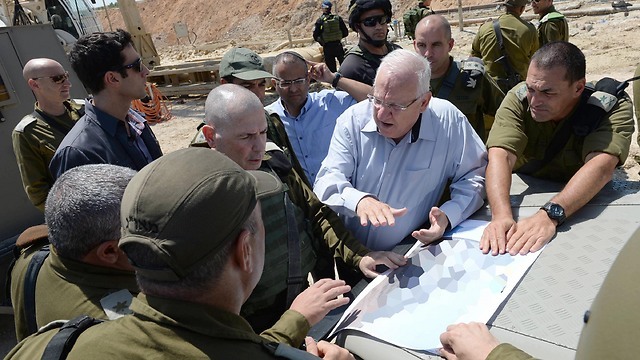 “We will not tolerate any disturbance of the quiet, and in the face of any such disturbance we will respond swiftly and firmly,” Rivlin said during a meeting with dozens of soldiers of the Bedouin Tracker Unit, combat engineers, and from the Givati Brigade. “I can say to the citizens of Israel, the IDF is prepared and ready to face any threat above or below the ground in order to prevent any trouble not just around Gaza, but across the country,” Rivlin added. On a trip to the north, Avigdor Lieberman spoke on the IDF's role as a melting pot, rejecting multiculturalism and defending his order to ban soldiers assisting illegal resident children. Minister of Defense Avigdor Lieberman addressed the threat from Hamas in the Gaza Strip on Tuesday morning while in the north of the country. "It's impossible to expect the State of Israel to allow them to arm themselves, to steal money from the Gazans. They collect taxes and don't construct buildings with them, but tunnels," said the minister. Addressing journalists, he commented, "You know my opinions, and I don't need to add anything new. What you need to understand is that my approach is rebuilding in exchange for demilitarization. That's the formula. They know that if a crisis happens, Israel will solve the problem for them, the UN will solve (the problem), the European Union. They aren't interested in solving the crisis, but in building strength." 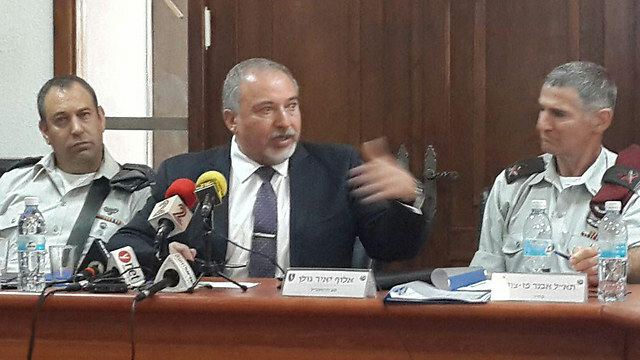 Lieberman was visiting the Education Corp's training base, Havat HaShomer, in the Galilee. He was joined by Deputy Chief of Staff Maj. Gen. Yair Golan and Chief Education Officer Brig. Gen. Avner Paz-Tzuk. The minister spoke at length about educating IDF soldiers. He stressed that nothing has changed in the IDF's central roles in protecting the homeland and serving as a melting pot: "Nobody has cancelled the order to be a melting pot. No multiculturalism. We've seen the result of multiculturalism in Belgium. The condition for the existence of the Jewish people and the State of Israel is an army of the people. We won't lend any help to ideas like multiculturalism and a professional army. The IDF must remain at maximal consensus. There were disagreements about my approach and my perception, and I was shocked to see the IDF deal with controversial things. I'm talking about infiltrators. "First of all, they came here illegally, and this is the most controversial topic in Israeli society, and it's not possible that it's what the IDF is dealing with. The IDF must remain the army of the people, and the draft for all is the basis of the army of the people." Regarding the Education Corps, Lieberman pointed out that next year will mark the 50th anniversary of the Six-Day War. He said, "That was the State of Israel's most beautiful moment, and it's worthy of a significant expression in the education program. Suddenly, when people talk about the Six-Day War, they talk about Mahmoud Darwish and not about the victories and the liberation of the Western Wall." 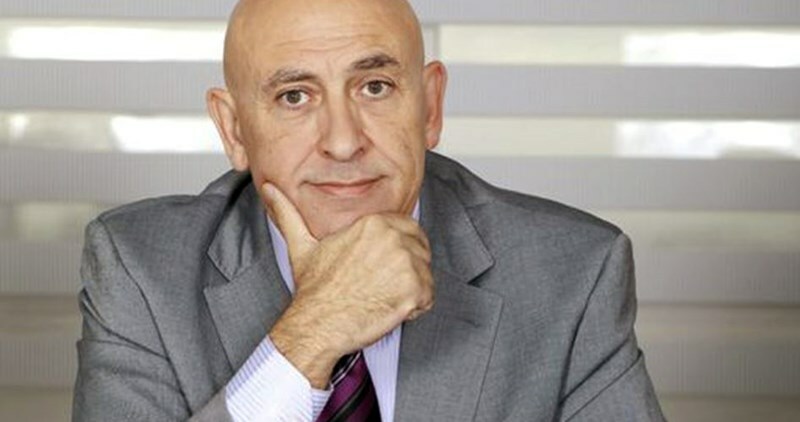 Israeli MKs called for ousting Joint List MK Basel Ghattas for his calls to boycott Israel at a conference in Montreal. 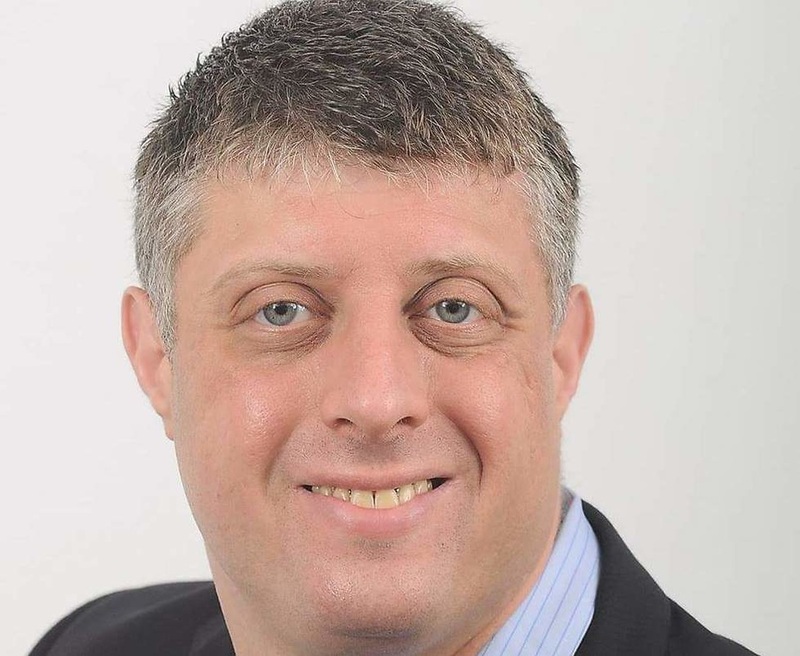 Yisrael Beiteinu MK Oded Forer called for sanctioning Ghattas over his calls for a boycott of Israel. “The theater of the absurd in the Knesset continues and the Joint List continues to prove that its MKs do not belong in the Knesset,” Forer said. “A member of parliament calling Israel racist and calling upon countries to boycott and sanction it is an unheard of act in any sane country in the world. It is not only delusional, it is against the law.” Forer said he checked the laws prohibiting action that would harm Israel via boycotts and he intends to ask the finance minister to remove special tax status from any organization connected directly or indirectly to Ghattas. Lawmaker Ghattas from Balad, one of the four parties that make up the Joint List, called Israel an oppressive, racist and apartheid state. He said he is pessimistic that there will be peace soon, and international sanctions were the most effective way to combat Israel. He said that the Israeli society is now governed by a military and settlement mentality, with political extremism existing not only on a government level but through all parties and institutions that play an important role in shaping policy in Israel. Dichter referred to Azmi Bishara, a founder of the Balad Party, claiming that he fled the country while under investigation and calling Bishara Ghattas’s “spiritual father... who betrayed Israel.” “Ghattas is sounding the voice of his master, and could be prophesizing his future in relation to loyalty to the state,” Dichter further alleged. 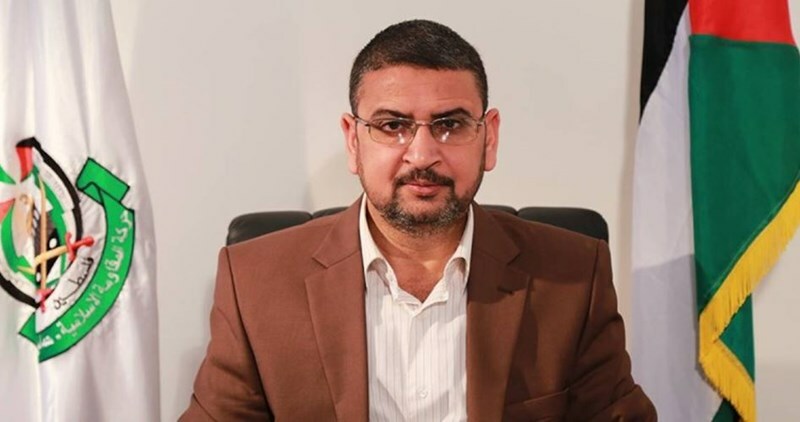 Hamas spokesman Sami Abu Zuhri has said that the rebuttal provided by the UNDP to the Israeli claim that one of its employee exploited its resources to help the Movement in Gaza vindicated further that the Israeli government was lying about that. "The UN's use of documents and figures to refute the Israeli accusations leveled against it about supporting the Hamas Movement has proved further that what Netanyahu relied on in this regard was a bunch of lies," spokesman Abu Zuhri stated on Monday. He expressed his confidence that Netanyahu's lies cannot fool the international community and its organizations anymore. The UN Development Program (UNDP) has denied Israeli claims that detainee Wahid al-Barsh, a construction contractor working for the agency, deviated from its principles and abused its resources to aid Hamas. Haaretz newspaper on Sunday quoted UNDP special representative Roberto Valent as saying that the agency conducted an investigation into the Israeli claim and found the material was transferred to the right place. Valent said that Barsh had no administrative powers or the ability to determine the destination where the rubble was to be transported. In a statement, the UNDP said "it works in partnership and coordination with the Palestinian Authority to implement projects in Gaza, including the rubble removal project." The statement stressed that Hamas had nothing to do with the organization's work. 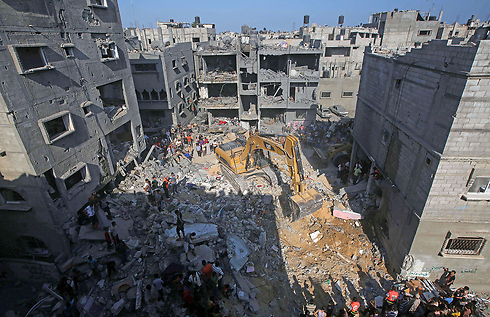 "There was no diversion of rubble from its designated location to Hamas," the statement said. "The rubble was delivered by UNDP in coordination with the Palestinian Authority to a civilian area. There were no signs of Hamas presence in that area at the time." Two years since Operation Protective Edge, some 70,000 Palestinians have not been returned to their homes, and only 200 homes have been completely rebuilt. Two years after the fighting between Israel and the Islamist Hamas movement in the Gaza Strip, about 70,000 Palestinians have not returned to their homes that were damaged in the fighting. Just 200 homes have been completely rebuilt and the families returned. "We ask the international community to increase their donations and the countries who pledged billions to respect their pledge," Adnan Abu Husna, spokesman for the United Nations Relief and Works Agency (UNRWA) told The Media Line. "The people of Gaza should not get to the point that they feel they are forgotten." Abu Hasna said that nearly 140,000 homes were damaged either totally or partially, mostly from Israeli airstrikes. Of those, 9500 were completely demolished, and 5000 were so damaged that people cannot live there. At an international donors conference soon after the fighting ended, UN officials asked for $724 million, but only received $257 million. He said the UN has helped nearly 70,000 families with some type of financial assistance. While thousands of families were originally housed in UN schools, all of those whose homes were destroyed have either rented new homes, paid for by the UN, or are living with relatives. The pace of reconstruction has been glacial, partly because Israel accuses Hamas, which controls Gaza, of diverting cement and other materials to build weapons and tunnels. Those allegations were strengthened last week, when the Israeli Shin Bet announced charges in two separate cases, against local employees in Gaza allegedly working for Hamas. In the first case, Israel accused Mohammed al-Halabi, the head of World Vision in Gaza, of diverting more than seven million dollars each year since 2010 to Hamas in Gaza. "We condemn any diversion of funds from any humanitarian organization," World Vision International President Kevin Jenkins said in a statement. "If any of these allegations are proven to be true, we will take swift and decisive action," although added that the organization had "not seen any of the evidence," and suggested the numbers had been exaggerated. "World Vision's cumulative operating budget in Gaza for the past ten years was approximately $22.5 million, which makes the alleged amount of up to $50 million being diverted hard to reconcile," the statement read. The organization suspended its operations in Gaza. In the second case involving the UN Development Program, Israel charged Wahid Borsch, funneled resources to Hamas to build a naval port for Hamas commandos. UNDP denied any wrongdoing, saying that "the rubble in question was transported to its destination according to written instructions from the Ministry of Public Works and Housing of the Palestinian Authority as to where it should be placed." UNDP officials also questioned the details of the case, saying they had not yet seen the evidence against Borsch. "We are waiting for the proof on all of these things," Dania Darwish, a spokeswoman for UNDP said. "Wahid is a contractor at UNDP. He does not have any management responsibilities. UNDP has strict processes and guidelines that must be followed." In any case, even if all of the damaged homes are rebuilt, the economy in Gaza faces growing challenges. A World Bank report found that Gaza's unemployment is the highest in the world, and many of Gaza's residents are completely dependent on UN food aid. Although Israel withdrew from Gaza in 2005, it continues to control what goes into and out of Gaza. Palestinians call it a blockade, while Israel says it has worked to prevent a humanitarian crisis. "Everyone talks about what is going in to Gaza, but we also have to think about what is going out," UNRWA spokesman Chris Gunness said. "Unless Gaza can export, there won't be a viable economy there. There have been no meaningful exports from Gaza since 2007." A spokesman for Israel's Coordinator of Government Activities in the Territories said they were unable to provide details of Palestinians exports allowed to leave Gaza.